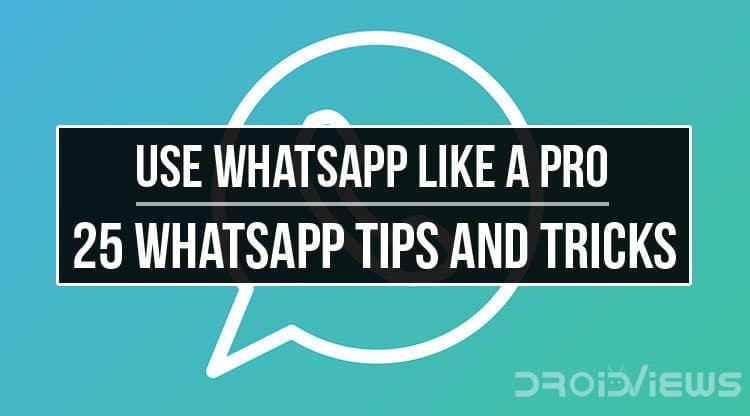 Here are 25 cool WhatsApp tips and tricks that you should know to use it like a pro. Just go through our exhaustive tutorial and believe me, you’ll learn a bunch of new things you must not be aware of even after using WhatsApp for years. WhatsApp is awesome and probably the most used instant messaging service in the world. It doesn’t need any introduction, it’s that popular. But just for the sake of an introduction, WhatsApp is an instant messaging service that lets you send and receive text messages (and photos and audio too) and make free voice and video calls over the internet without costing a single penny. You may be a novice or even an experienced WhatsApp user but nobody knows everything about everything. Now let’s check out the WhatsApp tips and tricks we have compiled for you. Our first WhatsApp tip involves with using different text formats and styles while sending messages. WhatsApp lets its users apply some basic formatting to the text messages before sending them – just like you would do in any word processing software. Thus, you can use text styles such as bold, italicized, monospace, and strikethrough. You can apply the text formatting in any specific part or all of your messages. Alternatively, you can easily format your text message into the above text styles without using any special character. Just type some text, tap and hold it. You’ll see a pop-up with options like ‘cut’, ‘copy’, paste’, etc. Tap the 3-dot icon. 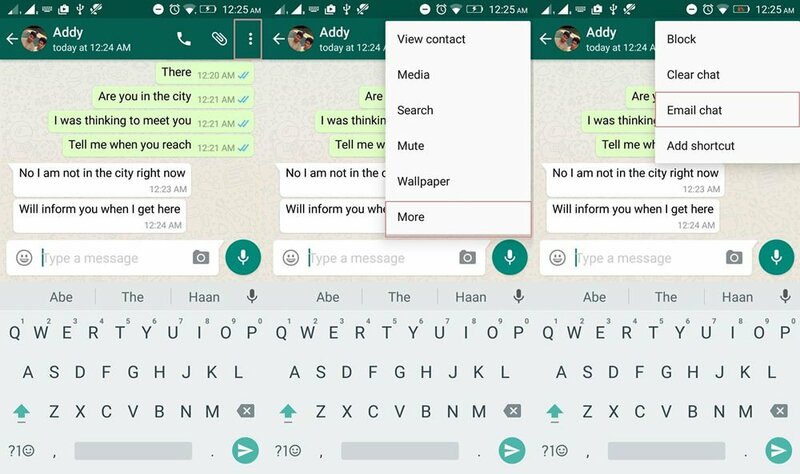 You’ll then see all 4 text formatting options available in WhatsApp. With the recent update, WhatsApp has added the function of backing up chats to Google drive. To back up your chat to Google drive, go to Settings> Chats> Chat back up. Now, tap on Back up to Google Drive. From the pop-up menu select the time interval i.e. daily, weekly, or monthly. 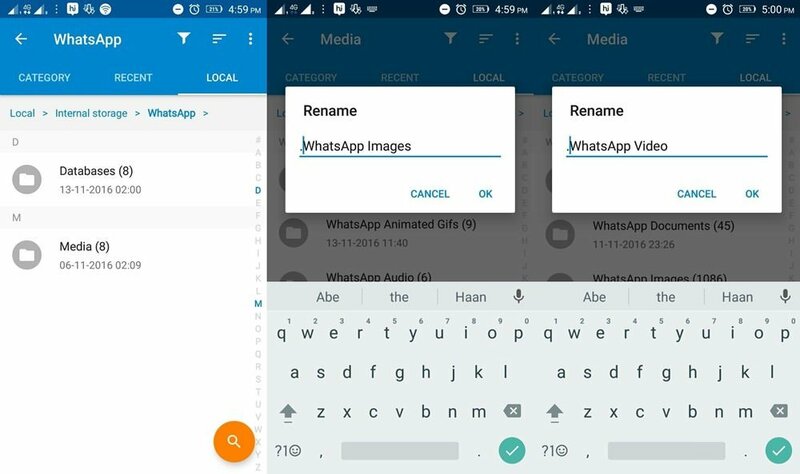 Now, when you install WhatsApp on another phone, select Google Drive when it asks to restore backup texts. Suppose you don’t want others to see your WhatsApp chat with a particular person. What do you usually do?….delete the whole chat by tapping and holding it!! Well, you don’t need to delete a chat to hide it from anyone. There is a simpler way to simply hide it. Just long press on the chat (conversation) you want to hide and tap on the Archive icon on the top right corner. You can view all the archived chats by clicking the ‘Archived chats’ link at the bottom of the conversations screen. Check their last seen. If it’s not showing then there is a chance that you have been blocked. Send them a text. If you see the double check mark or blue check mark then you are not blocked. But if you only get a single check mark then there is a possibility that you’ve been blocked. Call them. If your call is not going through then it’s a strong sign that you’ve been blocked, unless they have uninstalled WhatsApp or their phone broke down. Check their profile picture. If the profile picture has not changed in a long time then it’s a possibility that you’ve been blocked. It could also mean that they haven’t simply changed their profile. To make sure check their profile picture from a mutual friend’s smartphone. If all the above-mentioned signs are true then you’ve been blocked. To hide incoming WhatsApp photos from your phone’s gallery, go to the internal memory of your phone using a file manager. Now go to WhatsApp > Media > WhatsApp images. Now create a new folder in WhatsApp images folder and name it .nomedia. Now no WhatsApp image will be shown in your photo gallery. Open a file manager of your choice. Go to Internal Storage > WhatsApp > Media. Rename ‘WhatsApp Images‘ to ‘.WhatsApp Images‘ and WhatsApp Video to ‘.WhatsApp Video‘ (note the dot [.]). This trick will simply hide these images from your phone’s Gallary app. You can still view the hidden images and videos by using a file manager app. A recent update has made it possible to stop WhatsApp images, GIFs and videos from appearing in your device Gallery app. You just need to Go to WhatsApp Settings> Chats and uncheck the Show media in gallery option. You may not talk to each and every WhatsApp contact of yours every day. We all have few friends to whom we talk the most, to whom we send texts all the time. For such friends, you can create a home screen shortcut so that you can start chatting with them right from your home screen. To do so, open that contact on WhatsApp, tap on three vertical dots on the top right corner, then select More, and then tap on Add shortcut. Now you’ll see a WhatsApp shortcut for that friend on your home screen. 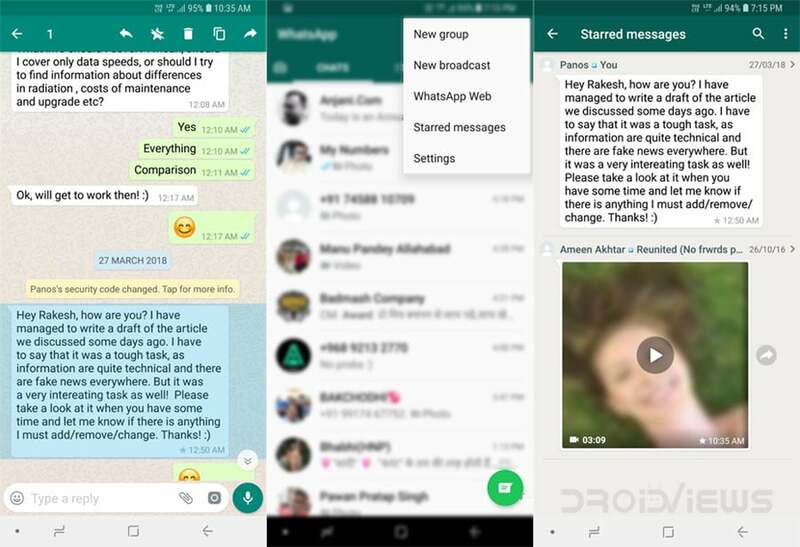 WhatsApp backs up all your chats every day at 2 AM in the morning (if you have not manually changed this). So, if you have deleted anything dated prior to 2 AM the same day, you can easily recover them. 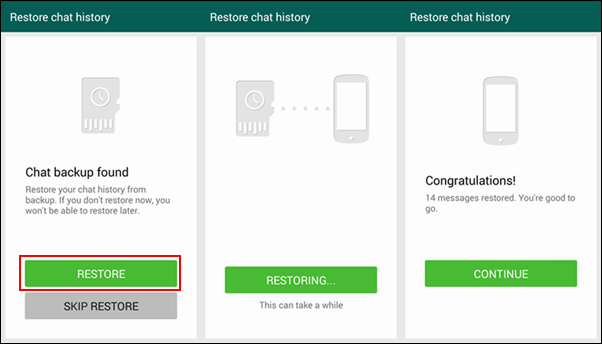 To recover the deleted chats, you need to uninstall and reinstall WhatsApp. After reinstalling, while setting up the app, you will get an option to Restore the messages. Simply tap on it and WhatsApp will restore all your messages. Please keep in mind that any message that you received after the backup time cannot be recovered! Go to the chat you want to save/backup. Click on Options> More> Email chat. Please keep in mind that you can only send a maximum of 4000 messages. You will also get an option to email the messages with or without media. In case you didn’t know, WhatsApp keeps making a backup of your text messages from time to time. These backups are stored in your phone’s internal memory (path: internal memory/Whatsapp/database). 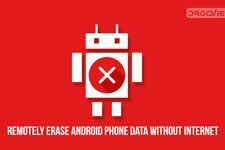 To restore deleted messages you first have to uninstall WhatsApp from your phone or clear WhatsApp data from your phone’s app settings. After doing so, install or open WhatsApp again and fill the necessary information like your phone number, name, etc. Once it’s done, it will look for text backups and will restore the most recent texts it backed up. I hate group chats and all my friends know this but still they keep adding me to such groups. Leaving the group every time they add me just doesn’t seem good. That’s why I simply mute group chats. 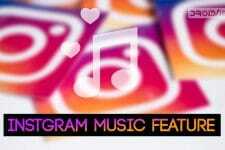 To do so, open that group and tap on three vertical dots on the top right corner, then tap on Mute, now select for how much time you would like to mute this group (8 hours, a week, or a year) and select whether you would like to see notifications or not. It’s done. Sometimes, something will be right in front of our eyes and we will not notice it. It is surprising how many people have no idea about this feature! 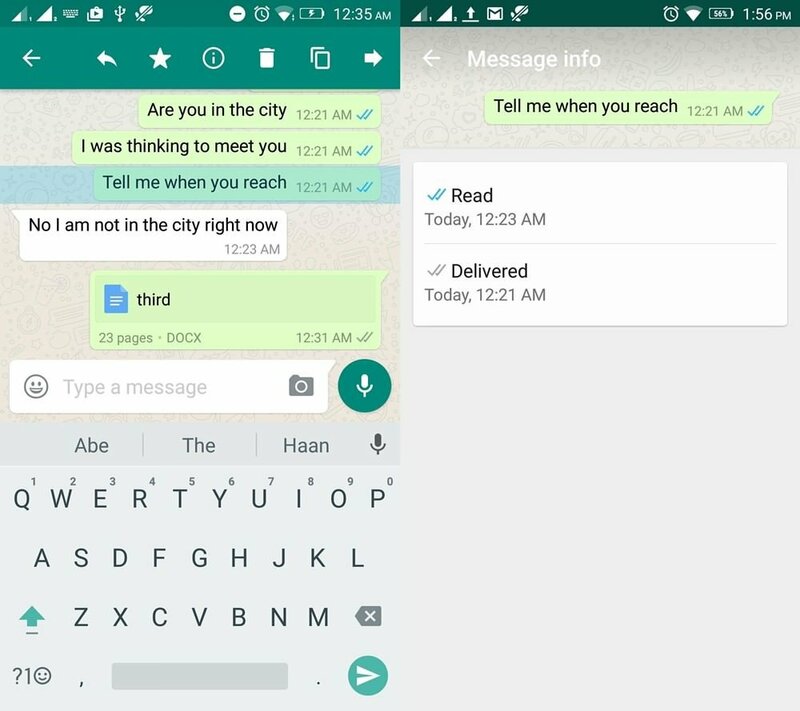 There is an option where you can see the actual time of when a message has been delivered and when it has been read. To see check the sent messages’ details, open a chat, tap and hold any sent message, then tap the info (or i) button from the action bar (top). One of the most less used features in WhatsApp is message broadcasting. 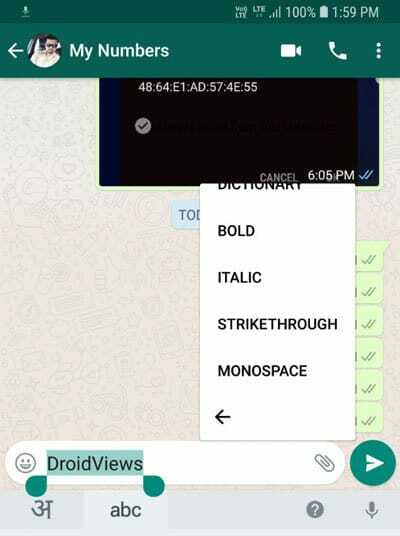 If you want to send a similar text to lots of people at once but don’t want others to see who else also received that text, then Broadcast feature is for you. It’s quite simple to use. To do so, open the app and tap on three vertical dots on the top right corner, then tap on New broadcast. Now select all the contacts to whom you want to send the text, write the message, hit send, and the job is done. 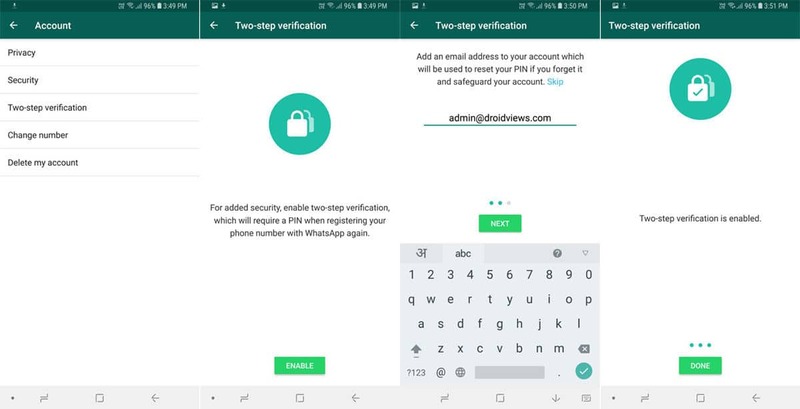 WhatsApp has the two-step verification feature for extra security so that nobody else can register your phone number with WhatsApp and access your account. To enable 2-step verification, open WhatsApp and go to Settings> Account> Two-step verification and tap the Enable option. You’ll be asked to set a 6-digit pin and give your email address to reset your PIN in future in your forget it. With the growing use of the Internet and social media, the increasing number of cyber crimes and personal data leaks, privacy has become one of the major concerns. In case you want strangers to see your WhatsApp DP (display picture), your status, or even the very thing that you have seen their messages, WhatsApp offers all these features. All you need to do is to explore WhatsApp’s privacy settings by going to Settings> Account> Privacy and customize them to your needs. No matter which smartphone you use or what display size it has readability matters a lot to save your eyes from strain. 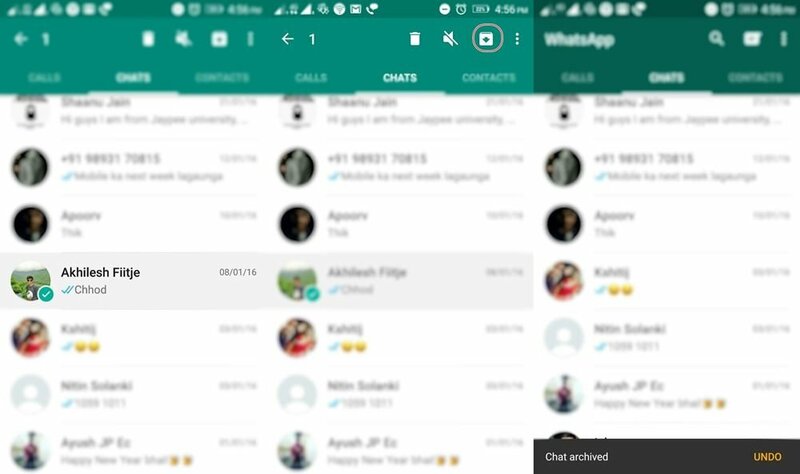 WhatsApp lets you change the font size for chats so that you can adjust it for better readability. Just go to Settings> Chats> Font size and select the font size you want. 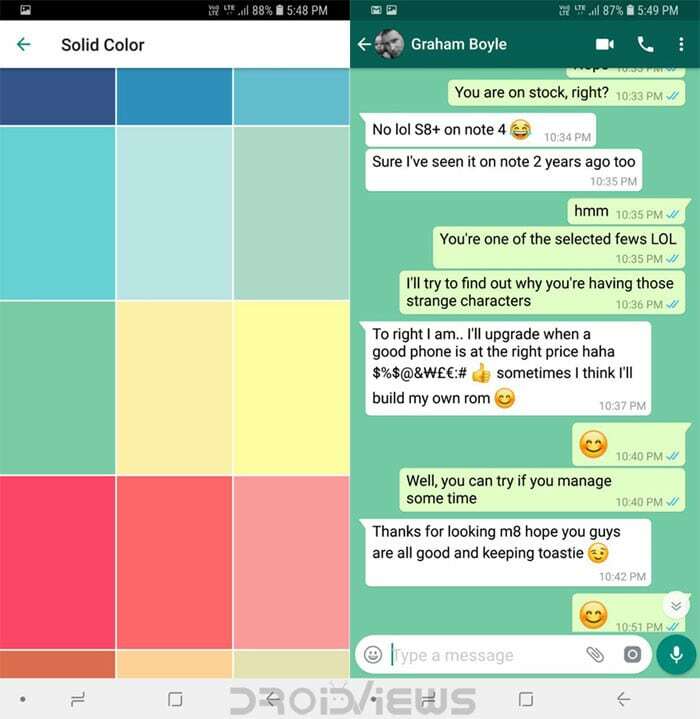 Personally, I like the default WhatsApp background for chats but if you want to replace it with your favorite color or any other image stored on your phone, you can do that easily. Launch WhatsApp. Go to Settings> Chats> Wallpaper and tap it. Here you can find options to select an image from your phone’s gallery or just use a solid color for your WhatsApp conversation background. Simple, isn’t it? Most WhatsApp users enjoy forwarding jokes, funny images, GIFs and videos and casual chats alongside those funny things, we also engage in formal discussions and serious business stuff. Sometimes, we have important messages that we need to save for later reading. To save you from the pain of searching for a particular message, WhatsApp allows you to star or mark a message as a favorite so that you can find and read it easily. 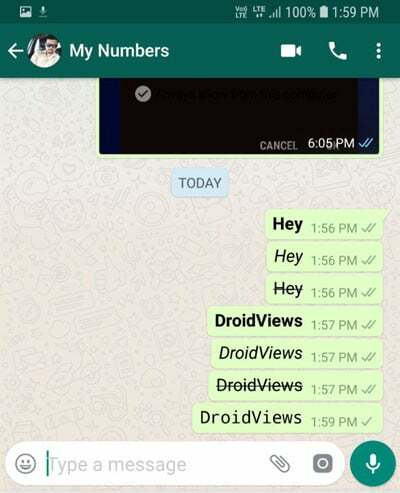 You must have used or at least noticed the Status tab between the Chat and Calls tabs. Under the Status tab, one can see the status updates of their friends and also update their own. These status updates vanish after 24 hours automatically. 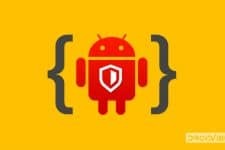 If you find this feature annoying, you can remove it given that your Android phone is rooted. Click the link below to know how you can do it. All of us have hundreds of contacts saved on our phone and almost all of them use WhatsApp and keep sending us messages. This makes our WhatsApp conversion list so crowded that we sometimes miss the messages from those we care about. To save you from the pain of scrolling down the chat list to view the messages from people who really matter. WhatsApp has become one of those apps that we can’t dispense with but every good thing comes with some unpleasant gifts. Every day I wake up in the morning, I find dozens of messages, especially from the WhatsApp groups. They come in such an abundance that I feel irritated because most of those messages are of no interest to me. Now, unless I tap every chat, in turn, the notification counter keeps showing the number of unread messages. I honestly hate this and if you’re one who feels the same, here’s a way to get rid of that humdrum job with a simple trick. 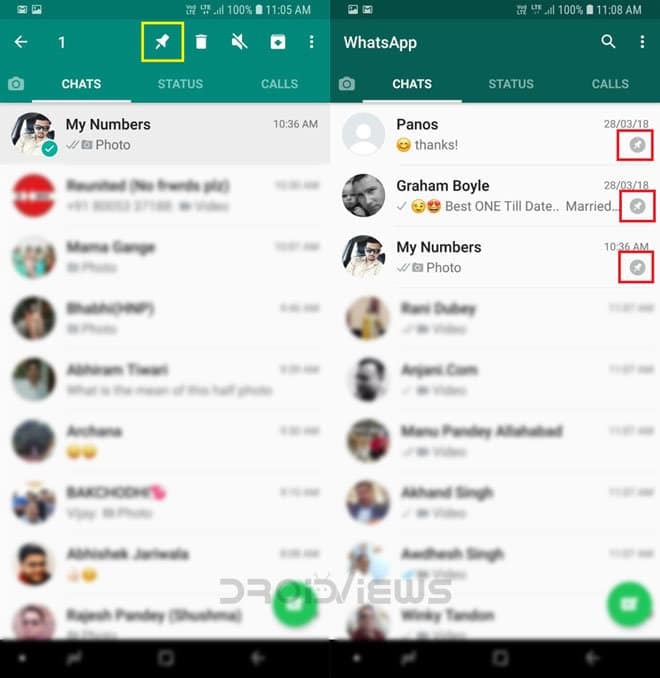 Open WhatsApp, tap and hold the chat with lots of messages and select the Mark as read option. WhatsApp is an incredibly popular messaging app and if you use it for business purposes like me, you can take advantage of the auto-response feature using the ‘WhatsApp Business‘ app for Android and iOS or just use a third-party app called ‘AutoResponder for WA‘. The app lets you set up multiple auto-response messages so that they’ll be sent to groups, individual contacts or both. Did you know all of these tips? Is there any other to that you think is worth mentioning? Tell us in the comments section below!